Henrik Borgstrom seems ready to start his NHL career after two years at college. Could he step in right away and be a contributor for the Florida Panthers, who are fighting for a playoff spot? Since the calendar turned to 2018, the Florida Panthers have been one of the best teams in the NHL. Now with their 3-0 victory over the New York Islanders, they find themselves just one point out of the final wildcard spot, and with a game in hand on the New Jersey Devils. With the price too high to go out and acquire anything at the trade deadline, Florida stood pact, and in doing so could be rewarded for doing so. With his college team, the University of Denver, eliminated from the NCAA Tournament, Henrik Borgstrom’s season is now over. Not only that but it also seems that the former first-round picks college career is also over. The Panthers have signed their top pick from the 2016 draft to a three-year entry contract earlier this week, and he could be a perfect addition to a bottom-six that could certainly use an offensive spark. "Henrik is a highly-talented, exciting and dynamic young forward who has been a dominant player over his last two seasons in Denver..." Said General Manager Dale Tallon of Borgstrom. 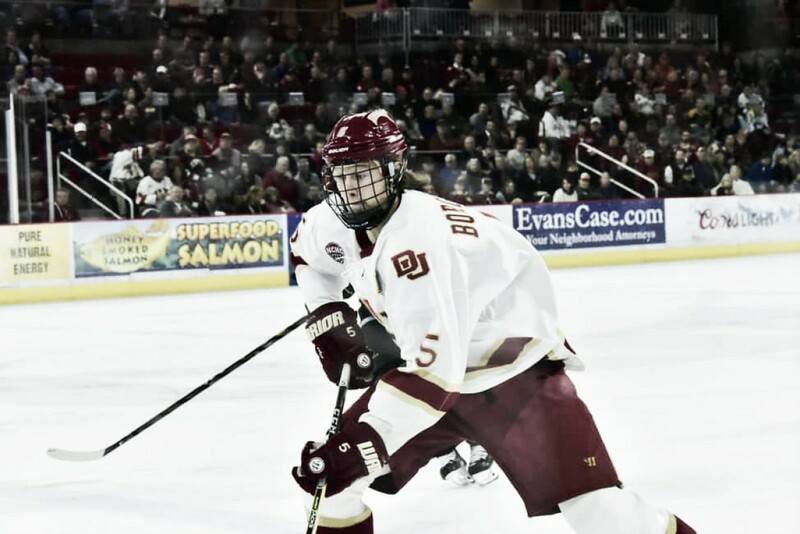 In just two years at Denver, Borgstrom emerged as one of the top prospects in all of hockey and was heavily sought after during the trade deadline. It wasn’t always that way, as when the Panthers drafted him 23rd overall, most believed that it was a reach to take him that high and that they could have potentially drafted him with their second-round pick (38th overall). Borgstrom, now a 20-year-old lanky 6’3” scoring machine that has earned the nickname ‘The Artist’ for his stick-handling ability, quickly earned his draft status, posting 43 points (22-G, 21-A) in 37 games as a freshman. Along with Troy Terry and Hobey Baker winner Will Butcher, Borgstrom helped lead the Pioneers to the National Championship as a freshman. Borgstrom’s sophomore season put himself in position to be a potential Hobey Baker winner, awarded to the nations top college player, as he was recently named one of the finalists. In 40 games this season, the Finnish pivot registered 52 points (23-G, 29-A), Borgstrom ended up in a tie for fourth in points this season, eight off the leader. Now with nothing left to master at the college level, Borgstrom now turns to the pro ranks. The Panthers have no shortage of centers at the NHL level. Aleksander Barkov and Vincent Trocheck lead the way. Florida is so stock full at the position former first-round pick Nick Bjugstad has made the transition to the wing amidst a career season. While Florida has one of the best top-six in the league, the bottom-six could certainly use a boost. There is some talent there, Denis Malgin has nearly doubled his scoring output from a year ago, all while playing in the same amount of games (19 points this year compared to 10 last season, both in 47 games), and Jared McCann is continuing to show strides in his second season with the organization. While the Panthers do rank 13th in the NHL in goals-per-game (seventh among Eastern Conference teams), there is little doubt that they could use a player with the ability to create, for himself and for others. There is no question what Haley is there for when he is in the lineup, and it shows in how little he produces offensively. His goals-for percentage (GF%) is impressive, but he gets little playing time in situations that could allow him to be scored upon. MacKenzie brings a veteran leadership presence to a still young locker room, that alone has been his ticket to the lineup on a nightly basis. Defensive wise, he is the team’s third go-to option (behind Barkov and Trocheck), so it makes his puck possession metrics, and lack of offensive numbers all the more concerning. He will dress, no matter, but having someone like Borgstrom on his wing could help find some (if there is any), offensive production buried in MacKenzie’s game. As a general manager, you always need to have your eyes on the future, something Dale Tallon is doing with Borgstrom. With another expansion draft likely in the next few seasons, playing Borgstrom this year comes with consequences. If he appears in a game, and under the most recent expansion draft rules, that would make Borgstrom eligible to be selected and Florida would have to ‘protect’ him. During Vegas’ expansion draft, the Panthers found themselves in a tight enough spot in selecting who to protect, and while he would be an obvious choice, it could expose another key player on the roster. Florida already was forced to trade Riley Smith and Jonathan Marchessault for cap reasons as well as roster constraints. They could lose someone even more important the next time around. Tallon is adamant he will do what is best for the team and will worry about the expansion draft when it comes around, but that kind of thinking is what caused them to lose a 70-point player for next to nothing. There is no doubting that Borgstrom is going to be a key player for the Panthers for years to come, but will it be as soon as this season? Throwing a rookie with no professional experience on a team with nothing left to play for is one thing, but for a team fighting for a playoff spot? Florida has been one of the best stories in NHL during the second half of the season, digging themselves out of the bottom of the standings right up to knocking on the playoff's door. Can adding Borgstrom be that little bit they need to get them over the hump, and into the playoffs? After a day off on Tuesday, Florida plays three games in a four-day stretch, so the opportunities will certainly be there. Can Borgstrom be a contributor for the Panthers down the stretch and into the playoffs? Should the Panthers play him this season or ride the lineup they have been going with? Let us know what you think in the comment section below.